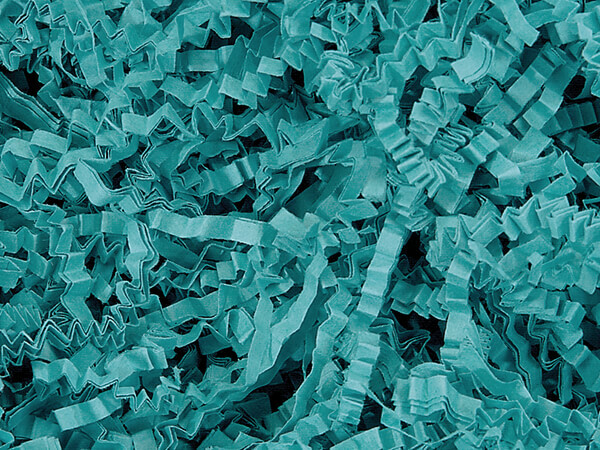 Teal Crinkle Cut™ Paper Shred (Zig Fill). Actual shred size is 1/8" and sold in 40 lb. cartons. Made from 100% recycled paper. Green Way® Eco-Friendly Packaging. Made in the USA. Note: Product ships from separate warehouse via normal ground service, only to US destinations & cannot be expedited. Due to high Christmas sales volumes please allow 72 hours for order processing and shipment on normal orders. Large orders require additional time. Please call our customer care department for details 1-800-547-9727.